Two thousand years ago when Jesus walked on this earth He gave mankind a message. He taught them in parables and showed them way to the Kingdom of God. Today we have Bhagawan, the Supreme Lord, once again walking the earth and showing the way to HIS Kingdom. Back then it was the Son and now it is the Father. 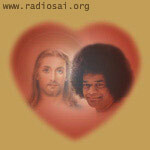 Sathya Sai: I command you: never hate others, or wish evil of them or talk ill of them. Only then can you attain the state of Santhaswarupam [become the embodiment of Peace].